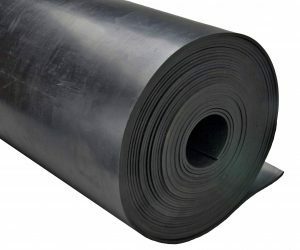 Nitrile (Buna-N, NBR, Nitrile butadiene) Rubber is a high quality sheet rubber designed for maximum oil resistance and general purpose industrial applications. Offered in 36 inch and 48 inch wide rolls, it can also be slit to width or custom cut to your specifications. Nitrile rubber is recommended for oily environments such as auto shops, petrochemical processing and transport, and oily atmospheres. The material can withstand alkalis acids and hydrocarbon solvents. Available in white FDA grade non-marking nitrile in limited size range, minimums may apply.